Shanaaz is the director of the Children’s Institute, University of Cape Town and and lead investigator for the DST/NRF Centre in Human Development and a contributor to the South African Child Gauge 2018. She has a PhD and Masters in Public Health. Prior to this appointment she was a specialist scientist with the Gender and Health Research Unit at the South African Medical Research Council. She has 30 years’ experience in the women’s and children’s sectors and have worked within civil society organisations, as an academic, technical advisor to government programmes specializing in violence against women and children. 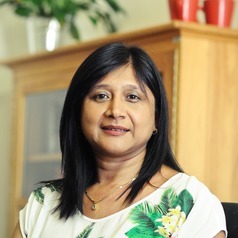 She currently serves as International Advisory Board member for the UNICEF Innocenti Research Office Florence, on the Multi Country Study on the Drivers of Violence and is a member of the Lead Investigator Group for the DST-NRF Centre of Excellence in Human Development, at Wits University. Her research interests include violence against women and children, as well as pathways to violent masculinities using both qualitative and quantitative approaches.